Oscar loves working and helping people with all of their real estate needs. When he first got in to the Real Estate Business, he decided to help people by offering the community the reliable advice of a professional, Trusted Adviser. Being an entrepreneur, Oscar saw Real Estate as a great opportunity of success by helping others. 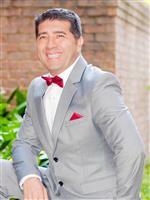 He is bilingual in English and Spanish and therefore has the ability to help many people find their dream homes. Because of this expanding economy, he is currently doing business with international investors in the U.S. and Latin American countries. Oscar has 3 wonderful children and feels extremely grateful for the life God has given him.